Come and experience the fly fishing trip of a lifetime. Let the guides of Alpine Anglers & Boulder Mountain Adventures in Torrey, Utah show you the perfect blend of recreation, relaxation and trophy fly fishing that awaits in over 80 high mountain alpine lakes, streams and beaver ponds. Experience fantastic Southern Utah Fly Fishing or one of our Guided Trophy Hunts that are sure to make memories to last a lifetime. We offer one guide for every two people and are able to give you the personalized attention and western hospitality you won't find anywhere else. We take anglers to the most productive waters Utah has to offer. Imagine the sensation of tempting record-breaking brookies, cutts, splake and tiger trout all in one trip. Enjoy the spectacular scenery ranging from red rock vistas to lush green forests where wildlife is in abundance. Our guide headquarters is conveniently located at the base of both Boulder Mountain and Thousand Lakes Mountain in downtown Torrey, Utah. We stock only the best in fly fishing gear and a large assortment of proven flies. 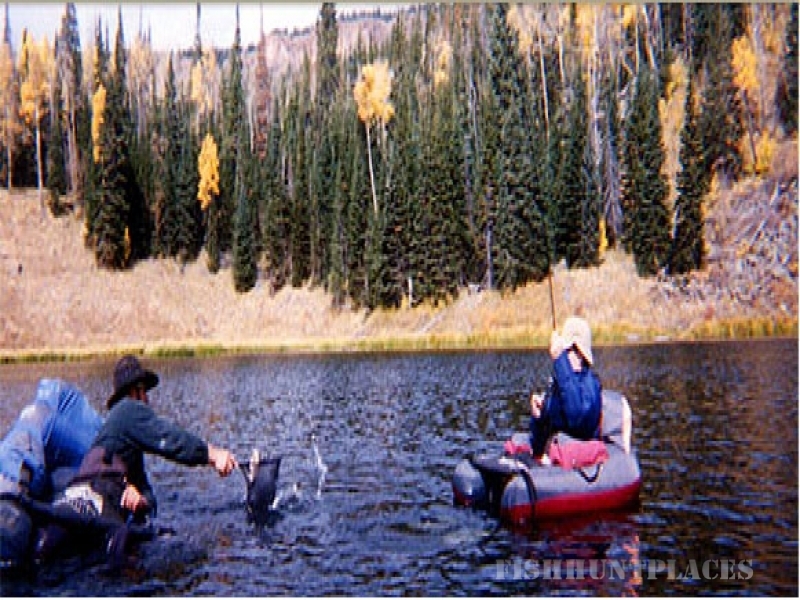 We offer guided fly fishing trips and guided fly fishing pack trips. Our expert guides will pack you and your party into the remote base camp by horseback, where you will rough it in luxury. Camp is situated at a beautiful alpine lake with several others just a short hike away. You will have the convenience of a giant wall tent for meals and socializing, with smaller tents for individual sleeping quarters. The beauty and fishing of this area just can't be beat, and you can look forward to some dutch oven cooking that will keep your mouth watering from one meal to the next. Don't miss this opportunity to share our summer playground.